This post is not about the vitamins and minerals in unprocessed foods. It is about the health benefits that occur when the food is prepared. We’ll use the snapping of green beans as our example. Green beans can be purchased in cans and in bags, ready for cooking, or even already cooked. They do provide nutritional value, but the benefits of preparing them from scratch are lost. The muscles in the hands and arms are exercised. The muscles of the hands and eyes are coordinated (as in an exercise for fine motor skills). The muscles in the neck are lengthened. The muscles in the abdomen are tightened, especially if the work is performed while standing. The muscles supporting the spine are exercised. The muscles in the shoulder blade area and chest are coordinated. The muscles that are used during breathing are relaxed because the action of snapping beans (if the person is not rushed) causes a slowing of the breathing. The muscles of the oblique groups of abdominal muscles and the re-absorption of water in the kidneys synchronize to optimize urine production. Muscles of the upper and lower torso move syncopatedly, which strengthens and stretches them. Muscles in the face rejuvenate when movements are focused on the work. (Talking on a phone while preparing the food cancels this benefit. Singing while preparing the food does not cancel this benefit.). Many other muscles and body parts are strengthened and stretched as well. Emotional balancing occurs when the work is done with a generous intention. Spiritual balancing occurs through connection with whole foods. If the work is done with another family member, opportunities can arise for heartfelt conversations. The food that will be eaten is personalized; in other words, its role as nutrition provider is elevated. 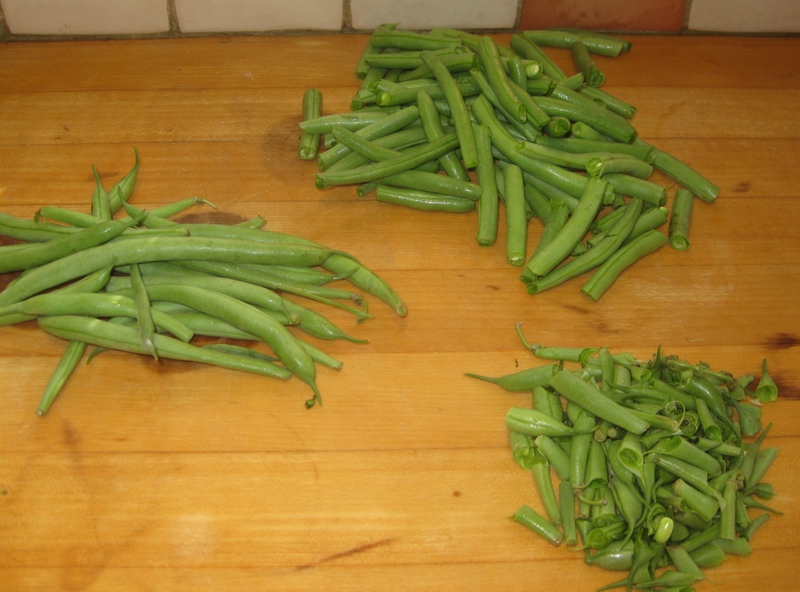 The color, texture, and shapes of the green beans at the various stages of preparation affect the senses in favorable ways. The more a person is involved in creating the meal he or she eats, the more uplifting and balancing the experience of eating.